The spot gold price ended the trading week, marginally above the $1000 per ounce price level at $1006.15, having at one point on Wednesday touched almost $1025 per ounce, following the breakout on the daily gold chart of two weeks ago. 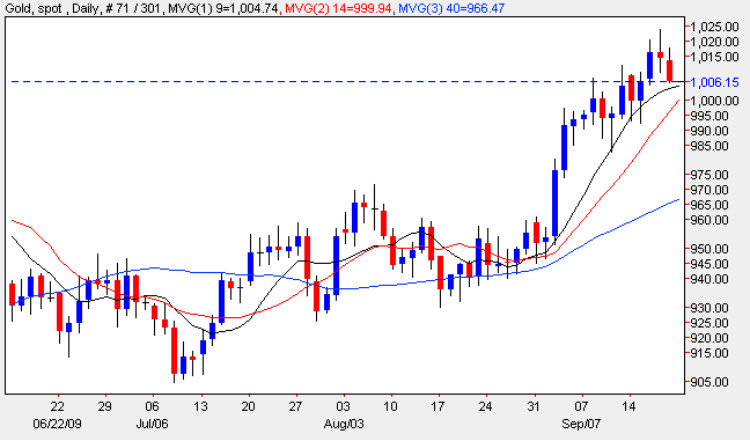 Friday’s candle ended the gold trading session as a narrow spread down bar, which confirmed the indecisive tone of Thursday which was signalled with a long legged doji candle and promptly confirmed by Friday’s price action. The question of course for this week ( as always ) is where is the spot gold price heading this week? Technically all three moving averages are pointing firmly higher, and indeed over the last two weeks we have seen the low of a trading session find good support from the 9 day moving average in particular, always a good sign in a bullish move. In addition we now have a degree of support immediately below the current price point, and for any deeper reversal this level will have to be breached, and once again the $1000 per ounce level will come into play should this occur. My main concern however this week is with the fundamental picture and in particular the forthcoming statement from the FED on Wednesday, not so much for the interest rate decision itself, but more the tone of the statement, and any direct or indirect references to the weakness of the US dollar, an issue which was raised recently by some G20 member states. With many market commentators now suggesting that the US dollar is over sold, any pro dollar statements could be the trigger that reversed the recent downwards trend for the US currency. So Wednesday could be a volatile day for the spot gold price market, and until then we must be cautious in our gold trading, and look for small positions on an intra day basis. The short term outlook for the spot gold price market is bullish, with the medium and long term sideways.